So when Dave asked her what a baumkuchen was and she answered ‘tree cake’ it did very little to explain exactly what is was. Dave tasted some and did not like it and there ended, or so I thought, our experience of baumkuchen. According to Larousse page 73, baumkuchen is a celebrated Austrian festival cake. It is meant to be hollow inside and is usually conical. This is because it is cooked on a spit. The batter is poured layer by layer onto a roller which is in front of open heating elements. 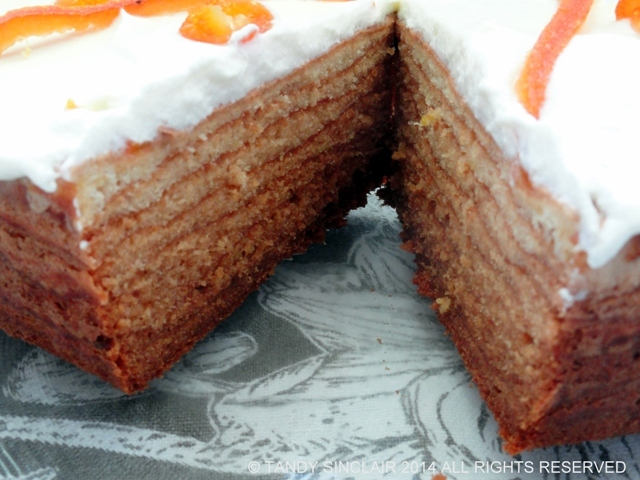 The layers remain visible after cooking, giving the cake the appearance of a cut tree trunk, from which it gets its name ‘tree cake’ or baumkuchen. Baum being tree and kuchen, cake. Strangely, my grandmother who was born in Austria, never made this cake for us, nor did she ever mention it. 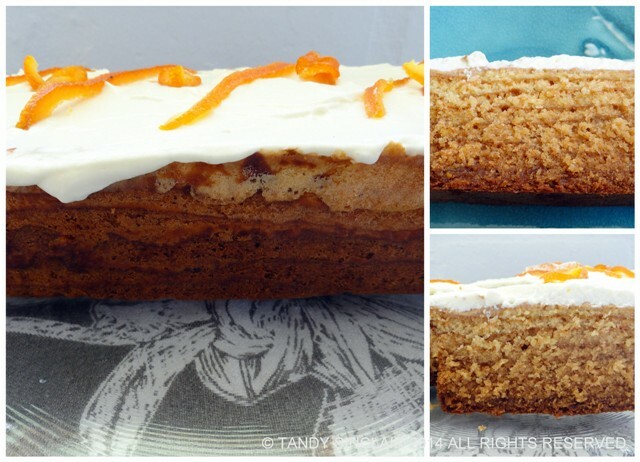 Not having a spit meant baking this cake, layer by layer, in a loaf tin. I would not do this again as it really is time consuming, but the taste and texture were well worth the effort, as well as being able to see the layers of course. If the egg mixture splits at any stage bring it back together by placing 5mls of the flour into the mix. I used 2 serving spoons per layer. Blog-checking lines: The January 2014 Daring Bakers’ challenge was hosted by Francijn of “Koken in de Brouwerij”. She challenged us all to bake layered cakes in the tradition of Baumkuchen (tree cake) and Schichttorte (layered cake). this is very interesting! love the layers of this cake! a fascinating story behind the cooking, and I admire you for trying and pulling it off ! What a lovely appetizing looking cake, Tandy,Waw even. Mmmmmm. Mmmm . . tree cake. oh Tandy, I cannot begin to imagine how much work this must’ve been. I so wanted to make this this month but it was such a crazy month with Australia Day and Chinese New Year that I couldn’t. Yours looks amazing Tandy! I’ll settle with eating this with my eyes. It’s very pretty. I’ve not tried making it because of the labor-intensive process, but have wondered if it could be accomplished with thin enough layers to quick-broil under an oven broiler element or even a salamander. Barring that, my own solution would be to move sideways to the recipes that make cakes out of stacks of crepes or large pancakes! Good on you for being willing to make the effort! Oh my word – what a labour of love. Sometimes it’s good to try out something new, even if you never attempt it again! It looks very impressive with the layers but I can understand why you wouldn’t want to make one very often. That cake is so impressive!! Love learning something new. Sounds like a lovely cake Tandy. Have a super week ahead.